Students will learn the difference between ghost and grace notes (while being encouraged to experiment with both in all six groove “families”), as well as important “go-to” grooves, like the Train and Bo-Diddley beats. 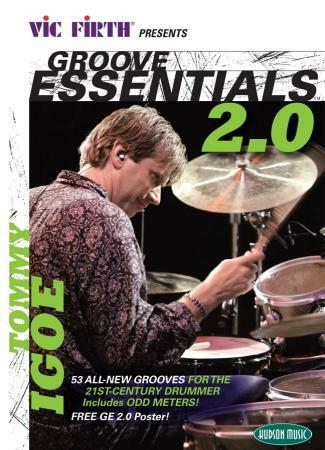 For more advanced players and professionals, GE 2.0 introduces the concepts of groove construction, interpretation and manipulation – training drummers to think like musicians in order to maximize their full potential. The DVD features more than 70 new songs covering 4/4, 2/2, 6/8 and 3/4 time signatures, with three levels of difficulty for 5/4, 7/8, and 9/8 meters. On this 3-hour and 45-minute DVD, Igoe discusses and demonstrates each groove in multiple tempos, alone and with a band, with many patterns shown on both acoustic and on Roland HD-1 and TD-9 electronic drum kits. The grooves span rock, funk, RandB/hip-hop, jazz (sticks and brushes), world/specialty, extreme tempos, all-purpose, hybrid, rideless, classic and odd-meters.